With a valuation of more than $16 billion, WeWork's incredible growth, alongside the emergence of at least 100 other growing coworking brands, proves just how popular shared and flexible office spaces have become. But as valuations climb and the headlines keep coming, we may be seeing the tip of the iceberg for an incredible wave of change coming to the commercial real estate industry. What's often forgotten amongst all the focus on coworking, are the much larger, more complex and far more interesting global trends at hand. As growing companies compete in rapidly changing markets, leases have been getting shorter and shorter for years. And landlords, who constantly compete for the best and brightest tenants, continue to load their buildings with amenities and "lifestyle" services. For example, take into account the transformation of residential tract development to more inclusive community-construction. From baby boomers to millennials, people are increasingly choosing compact, mixed-use communities with reliable, convenient transit systems.The sea change at hand lies within these service layers, as coworking and its implications send ripples into the biggest commercial real estate (CRE) players. In New York, this is already being seen as 180 Maiden Lane undergoes a $28 million renovation to include a 250-seat cafeteria, 150-seat luxury conference room, and brand new fitness facility. So, while WeWork's $16 billion valuation is staggering, commercial real estate is in the midst of a much larger transformation with hundreds of millions of square feet at stake. 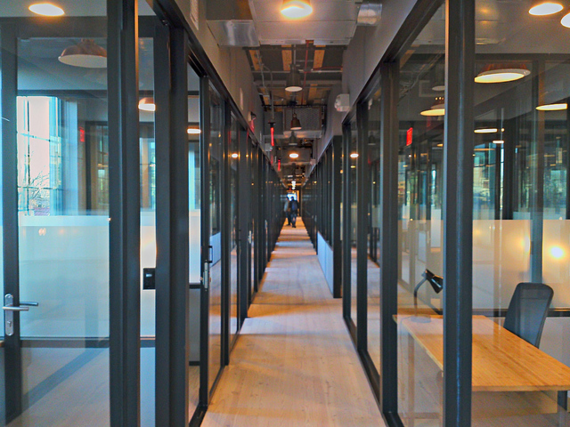 The high-touch, brand-forward solutions similar to WeWork may only be part of the story, but their rise will still be instructive for what the future holds. From large companies to fledgling startups, the emerging office customer will increasingly seek flexible work environments that can offer more than just a desk. The key here is to consider the decisions smaller freelancers are making about coworking; they represent what major tenants and corporations are also starting to choose upstream. Employees are now shaping the way companies go about buying real estate and office space: from the ground up. Traditionally, businesses often marked their success -- either real or imagined -- by moving on up and renting space in the most luxe office towers available. Older, established companies chose to pay for these monolithic office spaces, but younger millennial employees have no desire for such a place. The stuffy cubicle setting, mixed with slow security check-ins and an overabundance of suits isn't all that appealing anymore. The informality of a shared office space, not to mention the low cost, is attracting more and more people. Perhaps the scariest thing about this shift for CRE is that all sorts of companies seem to want these things -- not just the average nomadic freelancer. When PwC modernized most of its 83 U.S. offices, they added more communal space and made each office noticeably smaller, reducing the space per employee by 30 percent. In fact, shrinking office space is now common in the professional world. The average for all companies for square feet per worker in 2017 is projected to be under 151 square feet, compared to 176 square feet in 2012, and 225 square feet in 2010, according to CoreNet Global. And since those reports were released, the trend has steadily continued upwards. But what's more interesting is the Fortune 500's who have already opted to move some of their employees into cowork offices. 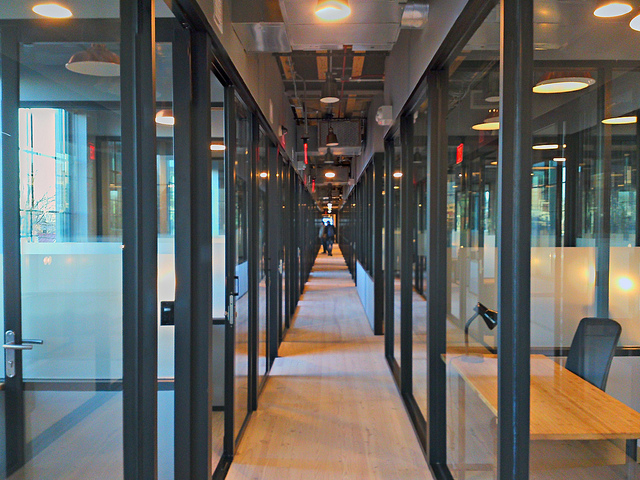 While PwC made communal space available in their own offices, General Electric moved 20 workers from its new energy business, Current, into a WeWork space near Boston's South Station in February. Furthermore, KPMG, Merck, and British news publication Guardian have all started renting temporary space separate from their corporate locations. It's really no surprise companies of all sizes are moving in this direction however. As the Harvard Business Review reported, members of a co-working space actually find their work to be much more meaningful, which leads to more productivity. There's a welcome sense of camaraderie that doesn't seem to exist in other offices. There will also be demand for the enormous one-location campuses used by the biggest companies. For most companies, scaling in one consolidated location just isn't the best way to go. Firms with dozens of employees often have operations spread across multiple locations. Even small companies may just have a handful of people working together remotely from across the world. With more work being done remotely, coworking spaces are tailor-made for such operations. The ease of signing up and the services they provide are a welcome alternative to consolidating operations in one global headquarters. Young businesses need to be nimble in order to succeed. Being stuck in a years-long lease is a nightmare for companies with hopes of scaling up or moving elsewhere. Even a five year lease can be too long for many larger companies. Convoluted leases with hidden catches can also be a problem. Cowork spaces provide a useful way to manage hefty real estate costs. It costs a traditional U.S. company nearly $12,000 a year for each worker it provides office space, according to experts at CBRE. While coworking spaces might be more expensive on a per-square-foot basis, it becomes easier for larger companies to move employees in and out of spaces fluidly. Naturally, companies can then shift focus to expanding rapidly into new locales rather than managing a risk portfolio tied to a long-term real estate purchase. A big appeal of shared working spaces is how easily they accommodate such growth. Spaces offer different options pricing options, but the companies are willing to pay a premium if it means they won't be stuck with office space they don't need. It's becoming clear that people thrive in the unstructured, communal work environment, as studies show people want (and need) something different from the traditional. And the potential to grow companies and real estate products aimed at serving millions of new workers in technology and innovation economy industries is immense. To that end, we will start to see the emergence of "high performance workplaces" designed to intentionally align with a company's business objectives and work processes, upgrading a worker's ability to be most productive. According to CBRE's Genesis Report, the traditional workplaces will be in the minority by 2030. Further, many coworking spaces will continue to revitalize vacant buildings while also driving urban community development for the surrounding areas. As of 2015, 42 percent of cowork spaces were located in buildings that already existed 50 years ago, and only half were located in the original designated commercial units. Altogether, those developers that take an intentional approach to partnering with tenants will ultimately drive competitive advantage with pre-existing knowledge of what people want. These workplaces will provide meaningful experiences that enhance an employee's general daily life through services, separate from work responsibilities.